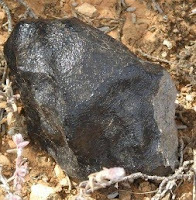 Researchers have discovered an unusual kind of meteorite in the Western Australian desert and have uncovered where in the Solar System it came from, in a very rare finding published in the journal Science. Meteorites are the only surviving physical record of the formation of our Solar System and by analysing them researchers can glean valuable information about the conditions that existed when the early Solar System was being formed. However, information about where individual meteorites originated, and how they were moving around the Solar System prior to falling to Earth, is available for only a dozen of around 1100 documented meteorite falls over the past two hundred years. Dr Phil Bland, the lead author of today's study from the Department of Earth Science and Engineering at Imperial College London, said: "We are incredibly excited about our new finding. Meteorites are the most analysed rocks on Earth but it's really rare for us to be able to tell where they came from. Trying to interpret what happened in the early Solar System without knowing where meteorites are from is like trying to interpret the geology of Britain from random rocks dumped in your back yard." The new meteorite, which is about the size of cricket ball, is the first to be retrieved since researchers from Imperial College London, Ondrejov Observatory in the Czech Republic, and the Western Australian Museum, set up a trial network of cameras in the Nullarbor Desert in Western Australia in 2006. The researchers aim to use these cameras to find new meteorites, and work out where in the Solar System they came from, by tracking the fireballs that they form in the sky. The new meteorite was found on the first day of searching using the new network, by the first search expedition, within 100m of the predicted site of the fall. This is the first time a meteorite fall has been predicted using only the data from dedicated instruments. The meteorite appears to have been following an unusual orbit, or path around the Sun, prior to falling to Earth in July 2007, according to the researchers' calculations. The team believes that it started out as part of an asteroid in the innermost main asteroid belt between Mars and Jupiter. It then gradually evolved into an orbit around the Sun that was very similar to Earth's. The other meteorites that researchers have data for follow orbits that take them back, deep into the main asteroid belt. The new meteorite is also unusual because it is composed of a rare type of basaltic igneous rock. The researchers say that its composition, together with the data about where the meteorite comes from, fits with a recent theory about how the building blocks for the terrestrial planets were formed. This theory suggests that the igneous parent asteroids for meteorites like today's formed deep in the inner Solar System, before being scattered out into the main asteroid belt. Asteroids are widely believed to be the building blocks for planets like the Earth so today's finding provides another clue about the origins of the Solar System. The researchers are hopeful that their new desert network could yield many more findings, following the success of their first meteorite search. Dr Bland added: "We're not the first team to set up a network of cameras to track fireballs, but other teams have encountered problems because meteorites are small rocks and they're hard to find in vegetated areas. Our solution was quite simple - build a fireball network in a place where it's easy to find them. The Nullarbour Desert is ideal because there's very little vegetation and dark rocks show up really easily on the light desert plain. "It was amazing to find a meteorite that we could track back to its origin in the asteroid belt on our first expedition using our small trial network. We're cautiously optimistic that this find could be the first of many and if that happens, each find may give us more clues about how the Solar System began," said Dr Bland. The researchers' network of cameras takes a single time-lapse picture every night to record any fireballs in the sky. When a meteorite falls, researchers can then use complex calculations to uncover what orbit the meteorite was following and where the meteorite is likely to have landed, so that they can retrieve it.